Turkey has occupied the headlines due to its foreign policy and the upcoming referendum on April 16. 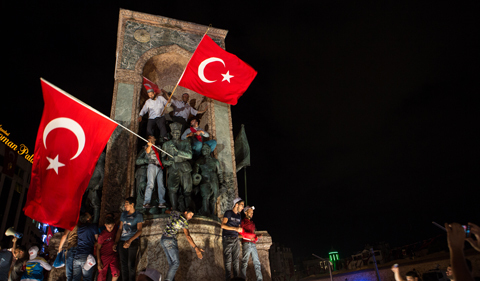 The War and Peace theme and the Center for International Studies host two prominent experts of Turkish politics, Dr. Ömer Taşpınar and Dr. Kadir Yıldırım on Thursday, April 13, at 6 p.m. in Porter 100. The panel, moderated by the Director of War and Peace Studies and Assistant Professor of Political Science Dr. Nukhet Sandal, will discuss contemporary debates and future scenarios in Turkish domestic and foreign policy. Taşpınar is Professor of National Security Strategy at the U.S. National War College and a Senior Fellow at the Brookings Institution’s Center on 21st Century Security and Intelligence. His research focuses on Turkey; Europe; Middle East; American Foreign Policy; Muslim Minorities in Europe; Political Economy; and Islamic Radicalism. He is the author of two books: Political Islam and Kurdish Nationalism in Turkey (Routledge, 2005) and with Philip H. Gordon, Winning Turkey: How America, Europe and Turkey can Revive a Fading Partnership (Brookings, 2008). Taşpınar is a frequent contributor to Turkish, European and American media and policy journals. Yıldırım is a research scholar at the Baker Institute for Public Policy at Rice University. His main research interests include politics and religion, political economy, politics of the Middle East, and Turkish politics. Yıldırım’s recently published book, Muslim Democratic Parties in the Middle East: Economy and Politics of Islamist Moderation, analyzes Islamist parties’ moderation trajectories and the impact of economic liberalization processes on moderation in Egypt, Morocco, and Turkey. His current book project addresses the effect of religious institutions on religious party evolution comparatively in the Middle East and Western Europe. He is the recipient of Smith Richardson Foundation’s prestigious Strategy & Policy Fellows grant in support of his book project. Yıldırım also serves the principal investigator for a Luce Foundation funded project that analyzes the relationship between religious authority in the Middle East and the U.S. foreign policy in the region. He published in journals like Party Politics, Politics & Religion, Democratization, Middle Eastern Studies, Sociology of Islam, and Soccer & Society. Dr. Yıldırım’s opinion pieces have appeared in the Washington Post, Huffington Post, and Al Jazeera. In addition to the War and Peace theme and the Center for International Studies, the event is co-sponsored by the Political Science and History departments, the Contemporary History Institute, and the recently launched Middle East and North Africa Certificate Program.